When I showed off the beautiful afghan/bedspread that one of Mom's friends crocheted for us, I know it was kind of hard to see how big it was. This is our full-size bed, with ample room on either side. Also, we've been doing laundry all weekend and I wanted to show off a relatively clean room. And no worries mom, I have thank you notes all ready to go out... as soon as I can find the pens I got..
Also, today I finished my quick-knit sock yarn shawl! Need to weave in the *ahem* ends TRIPSIE and give it a good soak and stretch, but I'm fairly pleased. Which is from the Schafer Company and is named after and inspired by Indira Gandhi! Jadie that bedspread/afghan is so pretty! 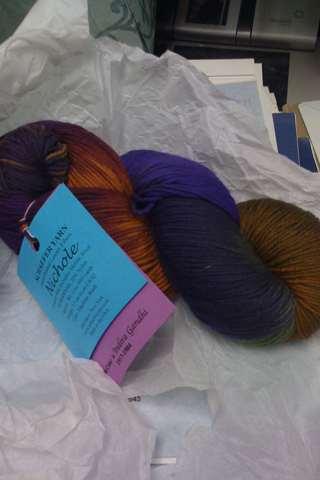 It's been a while since I've bought any yarn, isn't that terrible? lol I'll have to go buy some soon. And it is much bigger that I thought it would be. The afghan is lovely; what an amazing gift! Likewise, I'm lovin' the Indira Ghandhi; that's a really striking color combo. Where did you get it? See you on Saturday Birthday Girl To Be!